Are photographic orbs which appear in some photographs, truly representations of an energy form defined as the spirit of the dead or a human sole after we die or does science and psychology reveal otherwise? Paranormal spirit orbs are believed to be photographic representations of the spirit of the dead or a human sole after a person dies. Sometimes they are also considered as other types of energy forms, thoughts, extraterrestrials, natural spirits, and portals to another dimension or another worldly life form. They are adamantly defined by some believers to be a yet confirmed scientific phenomenon. It is estimated by positive orb experts that from 50 – 90 percent of orbs that show on photographs are false positive and conform to the scientific explanations of a photographic orb (i.e., originating from a backscatter). 1. Meditate and focus on your intention to manifest orbs. The orbs will eventually hear your call because they possess consciousness and intelligence. 2. Point your camera in a direction where a person or persons will be included in the frame. This is because orbs are attracted to people, especially large groups. 3. Refrain from using flash if you can. Some people, especially skeptics, believe orbs are caused by reflections of condensation and dust particles which are further enhanced by using flash. 4. Shoot photos letting your intuition guide you as to how and what to shoot. If you're using a digital camera, don't stop to examine the photos you take because the orbs probably won't be visible until after the photos have been downloaded to your computer. If you're not getting any results, stop taking photos. The energy may not be right and you should try again another day. 5. Find a method that works for you. Repeat that method when you photograph orbs and it will become a ritual, attracting the orbs to you. 6. Remember the circumstances and methods you used when you begin to see orbs in your photographs. There may be something you did that was a signal or energy call for the orbs to appear. Try using the same methods when you find something that works. Backscatter is light from a light source that is reflected back from deleterious substances on the lens surface or atmosphere that reflects back causing a speck of light to appear on the photograph sometimes referred to as an orb artifact. Substances suspended in air such as snowflakes, rain or dust can also cause an orb artifact. The miniature nature of modern digital cameras has increased the orb artifact effect since the distance between the lens and internal flash source is reduced. The reduction in distance decreases the angle of light reflection which increases the chance that light is reflected off of normally invisible particles. The increase in this photographic artifact has increased as a result of shrinking digital size. Please note that several hours of research did not reveal a vast amount of scientific information pertaining to the scientific explanation of photographic backscatter and the production of the orb artifact. What Defines Paranormal Spirit Orbs as Paranormal Phenomenon? The use of imprecise terminology and methods that are not scientifically proven are found throughout the definition and methods used to obtain paranormal orb photographs. For example, from the eHow list, Number 1: the photographer is told that meditation is required to obtain an orb photograph and no evidence is offered to prove that meditation can produce a photographic orb. Number 4: It is suggested here that the photographer use intuition as a guide in photographing an orb. There is a suggestion not to stop and look at photographs while taking them, wait until the photographic are downloaded since they probably won’t be observed while the pictures remain on the camera. These suggestions have no scientific basis and are very imprecise methods to obtain a good photograph. When describing orbs, believers use of the words energy, portals to another dimension, extraterrestrials and natural spirits do not define precisely what they are intended to be nor are they scientifically defined. Science uses precise terms to illustrate a position. In the How to Photograph Orbs video we are told that orbs can hear our intentions and respond to them because they have intelligence and consciousness. I have found no scientific evidence that our intentions make sound. Nor has science proven that spirit orbs exist. Believers sometimes use the photographic scientific evidence of the orb artifact to discredit or question the authenticity of an orb. There is an acknowledgement made by supporters that from 50-90 percent of orbs have real scientific explanations leaving the remainder to be unexplained by science and thus a prime example of pseudoscience. As illustrated in the video – orb photographs are not common during windy days or evenings but no explanation is given as to why windy conditions are poor for obtaining orb photographs. Perhaps the suspension of dust particles in the air during high winds is not conducive to orb photography. There is a testimonial given by the woman in the video about taking paranormal orb photographs and the psychic investigators website which is a prime example of pseudoscience and the paranormal. There are repeated personal experiences or testimonials rather than scientific based studies. On the ghost circle website, reverence is made to a series of facts one of which is substantiated by a Dr. Klaus Heinemann Ph.D. but no link or reference to the study is provided to the reader. This is a technique used by pseudoscientists by appealing to a false authority. The listing of fact after fact on this website is an example of making an extraordinary claim without scientific evidence. According to D. Alan Bensley (p. 63, 2007), Can Minds Leave Bodies? A Cognitive Science Perspective, some humans have a dualistic cognitive belief that their mind and body are unique and separate entities and that a sole exists as a component of them. In modern Christian cultures, the root of this religious belief is that soles live on after death retaining powers of perception. The paranormal belief in orbs might reside in the belief that soles live after the physical body can no longer carry them. The photographic orbs are considered to be a living sole after a person dies which is very similar to an out-of body experience or the belief in ghosts, and reincarnation. 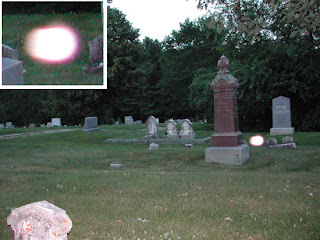 The difference from a photographic orb and the out-of body experience is the person having a paranormal out-of body experience is alive to report the experience. There appears to be insignificant amount scientific information published with respect to what exactly causes the orb artifact in a photograph. Surely there is no scientific evidence which substantiates that photographic orbs are the human soles or spirits. Perhaps, the scientific community is not concerned with such a trivial matter and there is no additional need for scientific investigation of this photographic phenomenon. Bensley, D.A. (2003, July/August) Can minds leave bodies? A cognitive science perspective. Lawson, Timothy J. Scientific Perspectives on Pseudoscience and the Paranormal Readings for General Psychology. New Jersey: Pearson Prentice Hall, 2007, p. 63-72. Print.